The best of the best, these puppies are the pick of the litter. We start with the very best hand selected Rose City Premium Shafting, grain weighed to a +/- 10 grains, next comes four coats of clear gasket lacquer, a double coat colored crown dip, a Classic Bohning Nock, then crested with 2 wide bands and a couple of small ones with many different colored highlights to match @ 9″ below the nock and then we put on two more wide bands highlighted right in the middle of the feathers. We then install a barred feather line up with the notch. 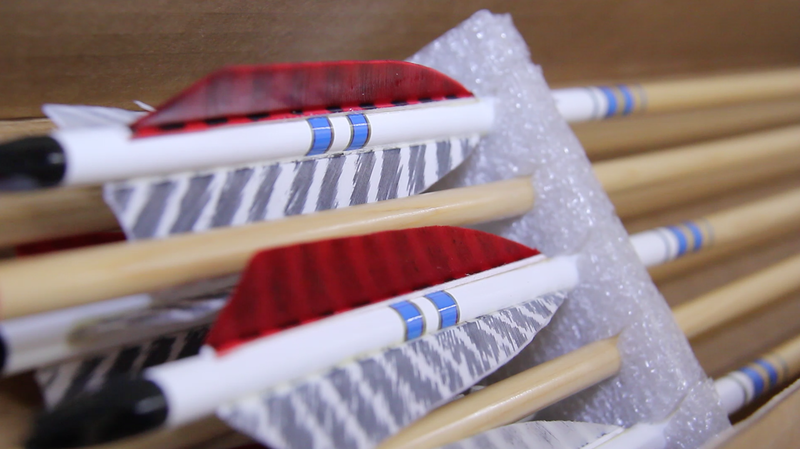 And two Barred Hen feathers, The arrows are finished off with the personalized signature of RCA’s President and CEO, Jerry Dision. Prices list are per dozen for full 32 inch length without points. Colors vary, but each set is always matched per dozen. Options in shopping cart for clear, mahogany or walnut stained shafts below crown, and point installation.